I’m back with another Design Team card for The Mixed Media Card Challenge. And since it’s a two-post day, I also have my STAMPlorations Stencil Sunday project to share with you here. The challenges run from the 1st to the 25th of each month, with the winners announced on the last day of the month. To play along, simply create a mixed media card and enter it at the Mixed Media Card Challenge. Be sure to check out the cards from the rest of the Design Team! So much inspiration! Most of my cards are created on the fly. I grab something and play with it. This started with three shades of Distress Inks and my ARTplorations Holly Background stencil. Just sponged them on until I liked the result. Hmmm, what next??? Grabbed some painter’s tape and masked off the bottom. Then I added some pigment ink using the “direct to paper” method…not really wanting a solid look…more streaky. The strip was heat embossed with clear ink. OK, needed something else…let’s do a wider strip, but a lighter color at the top. So that was done the same way. How fortuitous that I happened to have a stamp that uses the word “family” and has some arrows on it…lucky me 🙂 And finally, I added some micro beads that I recently received from my sweet friend, Loll. Thank you, Loll!!! Gorgeous card Lee-Anne 🙂 I love the colours you used they go perfect together. 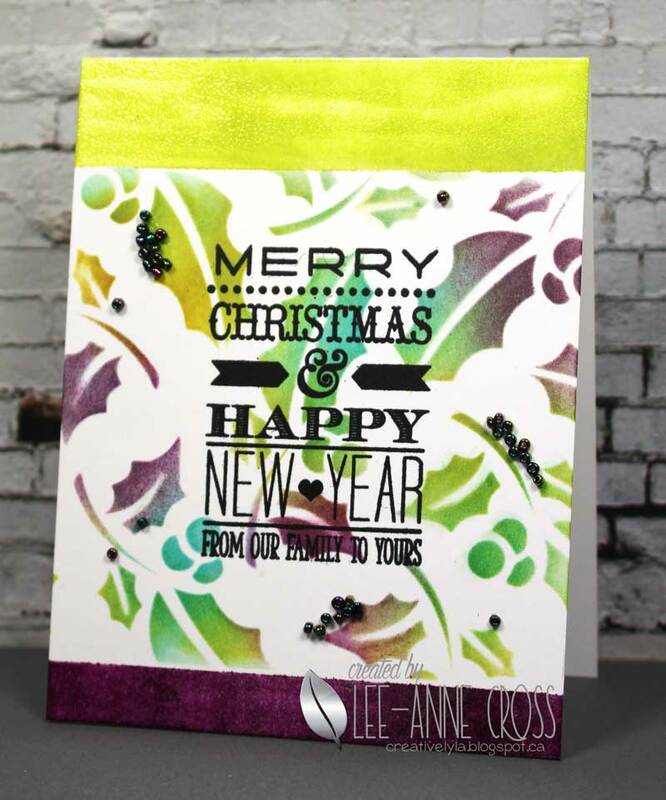 I love the non-traditional colors you used on your beautiful holly stenciling Lee-Anne! the seed beads add nice little spots of texture! Wow, a card set of colors is so beautiful. I love her every detail! Wonderful card.